I find it interesting when folks on Twitter and the ones who frequent this website are surprised that I point out every mistake in drafting a quarterback early. The problem, Thomas, is that “we” is only a selection of people. 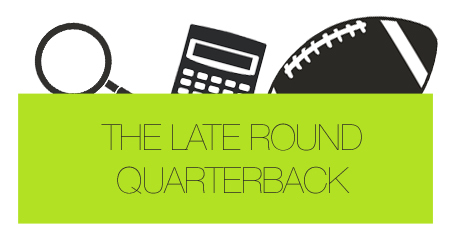 There are still plenty of individuals who feel drafting a quarterback early is safe. There are guys who believe getting Aaron Rodgers, Tom Brady or Drew Brees is the finest bet because they’ve proven to rank as the best at the position over the years. But let me ask you: If something is just a little bit better than something else – like, for instance, using a pen over a pencil – are you going to go out of your way to obtain one of those things over the other? If someone is offering you a free pencil when you’re in need of a writing tool, are you going to decline, drive to a Target, and buy a pen? The top leaders in passing yards were Andrew Luck, Brandon Weeden and Carson Palmer. Palmer’s yardage came at his favorite time of the game – garbage time – while Weeden and Luck actually had decent games from a yardage perspective. Luck, to be fair, threw for more touchdowns (4) than Weeden and Palmer combined (3). Four quarterbacks rushed for 70 or more yards. Kaepernick led the group with 84 yards, followed by Newton (78), RGIII (72) and Russell Wilson (71). Greg McElroy threw for more touchdown passes than Drew Brees. There were a few other quarterbacks who didn’t throw a touchdown pass in Week 13 (Sanchez, Bradford, Kaepernick, Rivers, Tannehill, and Lindley), but none were more significant than Drew Brees. Aaron Rodgers was the best “Big 3” quarterback in Week 13. He ranked 16th at the position. Brady was 24th and Brees ended up 31st. If we want to put this into perspective with the running back position [comparing the 48th and 62nd at the position, as you are starting two or three running backs per week compared to just one quarterback], Brady was the equivalent to Montario Hardesty, while Brees was just as good as Darrel Young. Drew Brees had the second most completions and the 31st most fantasy points at quarterback. Man, I could rip on Brees’ performance all day long. This is great. Ronnie Brown was second amongst running backs in receiving targets. Darren Sproles led the NFL with 9, while Brown secured 8. Steven Jackson led all running backs with 69 receiving yards. It really wasn’t close, either. Not many running backs caught the ball out of the backfield for big gains this week, as Darren Sproles, the back in second, had just 47 yards receiving. Matt Forte was also the only back to score a touchdown through the air in Week 13. Jamaal Charles led all running backs with 27 carries. See what happens when you feed the ball to Jamaal, Romeo? Bryce Brown was the only running back with multiple touchdowns on the ground. If and when LeSean McCoy returns, it’s going to be difficult for Philadelphia to remove Brown from the lineup. I’d still expect him to be a roster stash once Shady is back. Calvin Johnson had as many targets (20) as Miles Austin (2), Roddy White (7), Dez Bryant (6), and Steve Johnson (5) combined. I mentioned on Twitter yesterday that I did trade for Megatron in a league just before he broke free with four straight weeks with a touchdown, but did not draft him because of his reliance on touchdowns last year. I think it’s clear that he’s now just as useful and predictable as a top running back. Donnie Avery and Chris Givens were third in the league in receiver targets, behind only Megatron and Wes Welker. Chris Givens was much more successful in Week 13, catching 11 of his 14 targets, whereas Avery caught just 5. It’s clear that Avery’s one catch – the one that won the game for the Colts – was the most important between the two receivers, though. Donnie also got into the end zone twice. No receiver had more than 5 rushing yards. I guess it wasn’t a week for end-arounds. Pierre Garcon received 52.4% of his team’s targets, second behind only Brandon Marshall. Being high on Garcon coming into the 2012 season, I fully expect him to be an integral part of the offense as the Redskins make their playoff push. He’s a great candidate for one of those players who helps you win a fantasy championship this year. Anquan Boldin was targeted four more times than teammate Torrey Smith. I tried to warn as many people as possible on Twitter, but when the Ravens face the Steelers, Torrey Smith doesn’t see nearly as many looks as Boldin. Harbaugh likes to target the Steelers’ second cornerback – in this case, Keenan Lewis. Brandon Myers caught 14 of his 15 targets in Week 13. Garbage time? Maybe, but Myers is clearly a tight end that you can trust nearly every week. Jason Witten was the only non-Brandon Myers tight end with over 100 yards receiving. While we’ve seen a lot of great tight end performances this season, Week 13 proved to be the opposite. Andrew Luck is 4th in the NFL in passing yards, ahead of Tom Brady, Matt Ryan, Peyton Manning, and Aaron Rodgers. Luck has gotten a lot of opportunity, throwing the ball more than every quarterback not named Matthew Stafford (he’s tied with Carson Palmer with 503 attempts). His passing quantity, however, makes him even more useful in fantasy football. There are 13 quarterbacks who have thrown for more touchdown passes than Aaron Rodgers over the last 3 weeks. Some of the notables are Matt Schaub, Chad Henne, Andy Dalton and Josh Freeman. If the season ended today, Alex Smith would finish with the highest completion percentage. Let’s pour some out for Alex Smith’s 2012 campaign. No quarterback has given up more yards on sacks than Philip Rivers. He’s actually been sacked three less times than Aaron Rodgers, the leader in the category, but has given up 29 more yards from them. Robert Griffin III has 185 rushing yards over his last 3 weeks. That’s more than all but 16 running backs. And some of the notable players below RGIII include Reggie Bush, Matt Forte, Vick Ballard and Ryan Mathews. Marcel Reece has more targets (62) over the course of the 2012 NFL season than teammate Darrius Heyward-Bey. While Heyward-Bey has missed a little time, who really thought, at the beginning of the year, that Marcel Reece would be third in the league at running back in receiving targets? Trent Richardson has the most carries (77) of any running back over the last 3 weeks. BenJarvus Green-Ellis is in second with 8 less (69). Both of these AFC North backs get their fantasy value from quantity. But unlike BenJarvus Green-Ellis, Trent Richardson has talent. Jonathan Dwyer has a higher yards per attempt than Arian Foster. Plenty of people knock Dwyer because of his lack of speed and big body, but given the Steelers’ offensive line situation, his yards per carry isn’t all that bad. As for Foster – let’s blame his low yards per carry on the fact that they always seem to be short, goal line ones. Mike Wallace has had 6 receptions for over 20 yards this season. Calvin Johnson has 29. I can’t say it enough: Mike Wallace is the most overrated receiver in the NFL. Ramses Barden has just as many 20-plus yard completions as Mike Wallace. I thought he was a big play receiver? Davone Bess and Brian Hartline have just as many receptions as Roddy White and Julio Jones over the last 5 weeks. While Julio and Roddy have clearly been the better fantasy options, it’s interesting to see that Bess and Hartline have garnered some nice PPR value. Over the last 5 weeks, Calvin Johnson has 120 more yards than the second best receiver, Andre Johnson, and nearly 300 more yards than the third best, Brandon Marshall. I can’t stress enough how important Calvin Johnson is to that offense, and, in turn, to fantasy football. While his touchdowns held him back over the first half of the season, he’s proving that the Madden Curse is a completely irrelevant thing. Mario Manningham still leads the NFL with a 77.4% catch right. We can blame this on lack of targets, as Manningham has seen 53 passes come his way. That’s the 64th most in football at wide receiver. Jason Witten has the highest percentage of team targets amongst tight ends. Witten has seen 119 targets this season, and that’s given him a near quarter of all Cowboys’ targets.